Here is a brand new science fiction novel from the incredibly prolific story-teller Henry Vogel. This is set in the same universe as the fun YA space adventure (see my review here) but it's a standalone story so you don't need to have read the other books to enjoy it. After two thousand years of isolation, the lost colony world of Aashla has reestablished contact with the rest of galactic civilization. Princess Callan of Mordan, and her royal consort, Terran Scout David Rice, were the people who made that happen. Now, they lead the mission to ensure that Aashla's unique culture is not overwhelmed by the galaxy-spanning Terran Federation. But on a routine inspection tour of Federation scientific outposts, Callan and David are horrified to find an abandoned camp and a mass grave. When an unnatural storm knocks their airship out of the sky, they're forced to confront their worst nightmare. 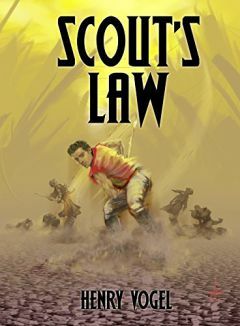 By the way, Scout's Law is currently free for Kindle Unlimited subscribers. If you want to see if subscribing is right for you, can get a Kindle Unlimited 30-Day Free Trial.